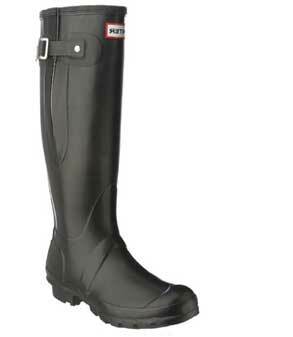 One of the most sought after wellingtons brands is Hunter Boots. 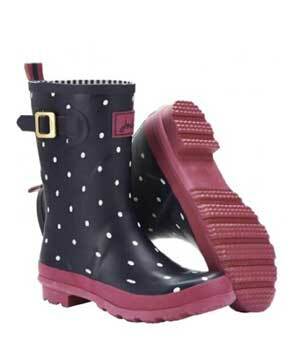 They have a line of super cool and funky wellies that are suitable for any occasion. 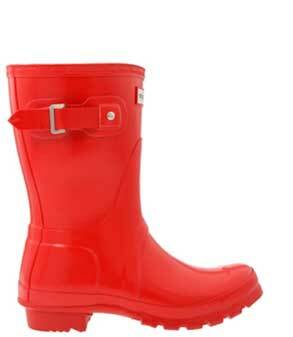 The collection includes the timeless classics as well as a selection of limited edition festival style rain boots. 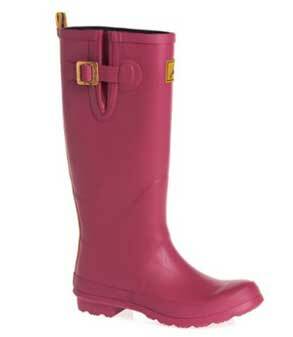 The classic wellie. 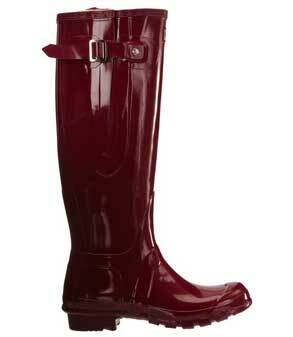 Favored by celebrities and models, these boots are tall, stylish and available in a host of attractive colors. All the style and elegance of the Original but with a super glossy finish. For women who want the perfect fit the Adjustable is the answer. Ideal if you like tucking in jeans or wearing thick socks. 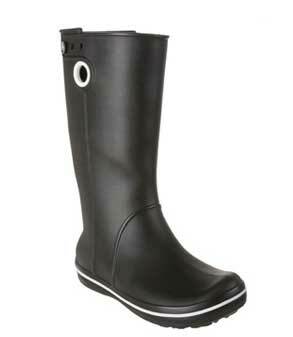 These classic black rain boots are a great choice for women with plus sized or athletic calves. If you like the Hunter Adjustable but want a bit of extra sparkle then the gloss version is also available. 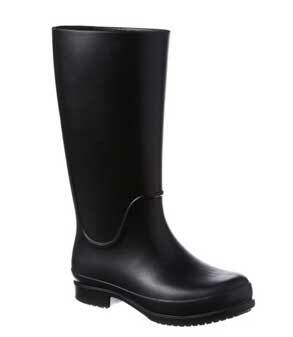 The Huntress is a wide rain boot that is styled on the Hunter Original but with more room for plus sized or athletic calves. The same comfort and flexibility as the Huntress but with the super shiny finish. 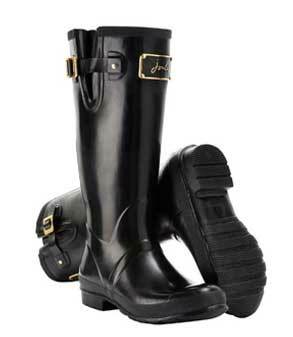 These women’s Hunter wellingtons are the business. 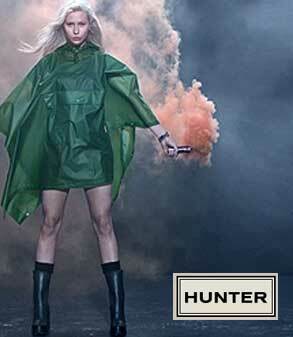 Hunter are probably the most famous wellington makers in the world and they just keep on delivering quality products. 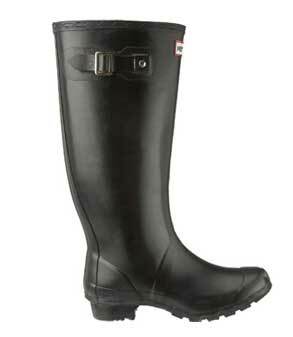 Another adjustable boot from Hunters. This time with a rear buckle. Suitable for getting the perfect snug fit and for wide calf sizes. 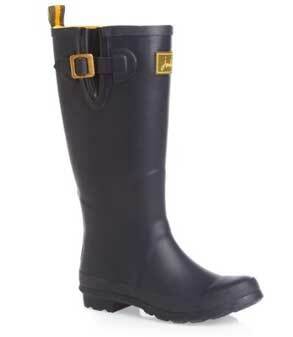 Gorgeous pair of elegant wellies. 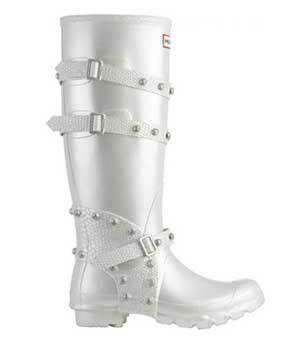 These would make a great pair of boots for any bride on a rainy wedding day. 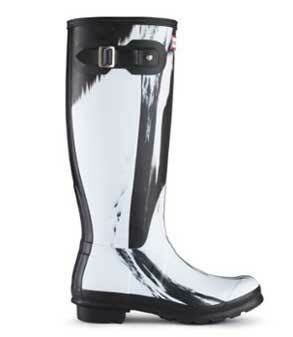 Limited Edition black and white festival wellies. 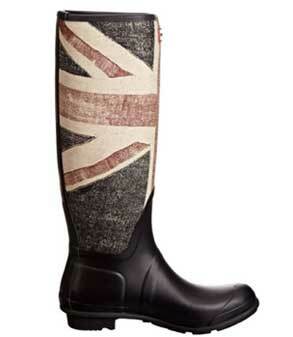 Hunter Original Union Jack wellie. Limited edition Wellington from from legendary manufacturers Hunter boots LTD. Styled with a distressed British Union Jack look, these rain boots are an eye catching option for the rainy days. 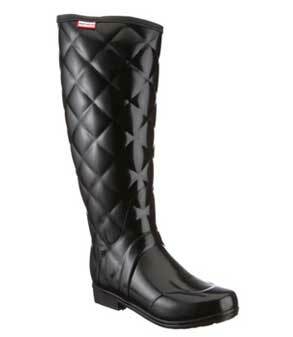 Elegant black quilted effect wellies. 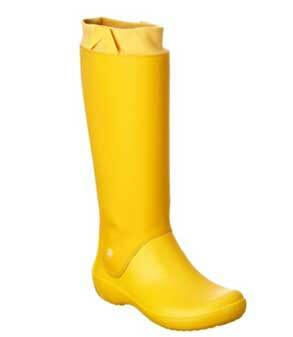 All the practicality of a rain boot but with a designer look. 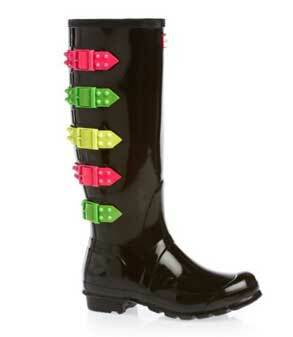 Plastic fantastic glossy black boots with neon colored side buckles. 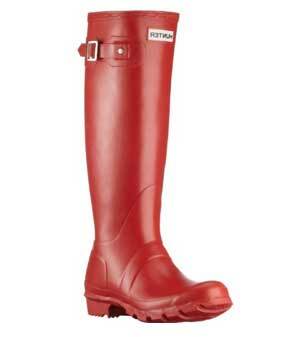 Big brand logos are in fashion this year and Hunter have added these striking red and white wellies with the iconic Hunter logo print down the side. Skull and Roses Festival welly. 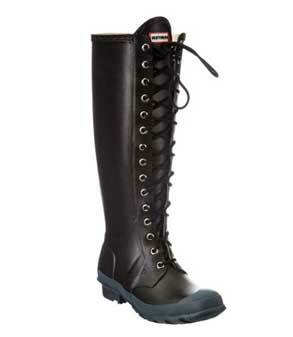 Edgy pair of women’s laced rain boots perfect for the outdoor music festival season. 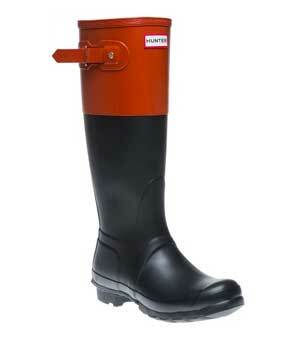 Red and black block welly. The classic Hunter boot with a twist. 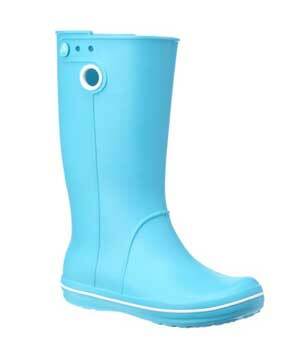 This welly is part of the block color collection. 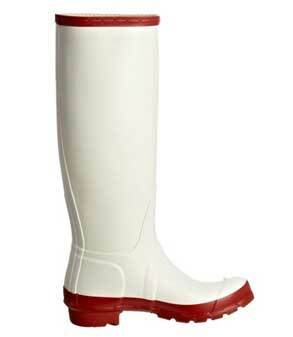 Stylish tall wellington boot. Comfort and quality at a reasonable price. 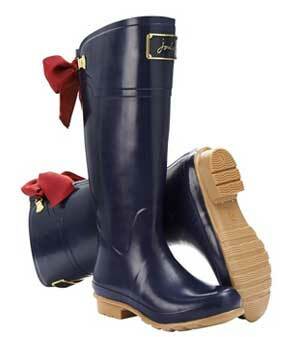 The joules Feildwelly in a more conservative navy blue. 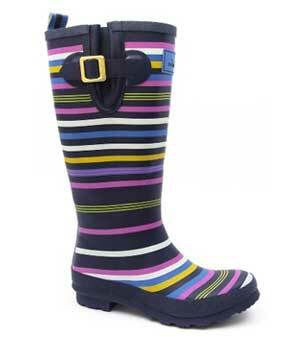 Funky multicolored striped wellies from Joules Wellyprint range. 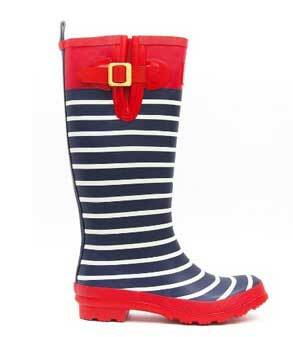 Striped boot with bright red tops and soles. 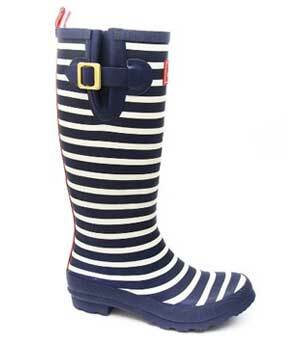 Cool nautical styled navy blue stripped wellies. 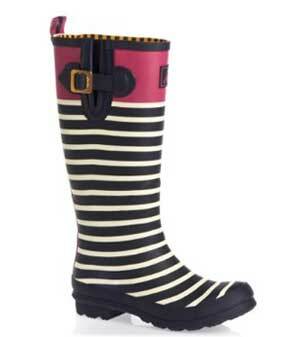 Joules Pink and White Wellyprint. These super cute pink spotted wellingtons are a great option for brightening up a dreary day. 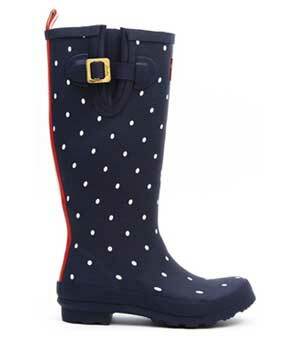 Cool polka dot wellies with elegant side buckle from Joules Wellyprint range. 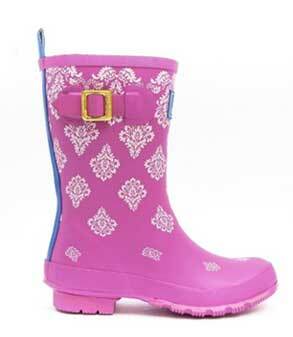 Cute printed Rain boots with a magenta top. 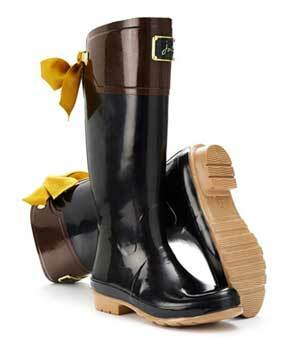 Luxury Rain boots with elegant rear bows. Beautifully styled wellies. Perfect for wearing on special occasions when the weather takes a turn for the worse. 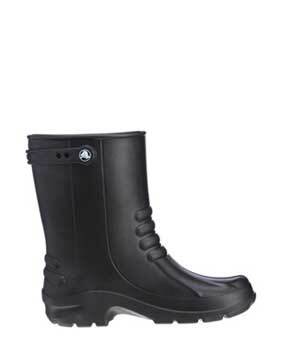 If you fancy a funky pair of ankle wellies that are super comfy, then these stylish designs from Rockport may be the answer. Puddles by Nomad For Women. The Puddles women’s rain boot is available in a huge range of designs. This leopard and rose print is our favorite. 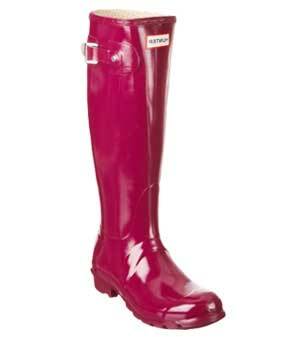 Mid-calf sized pink welly boot with blue candy stripped lining and cute buckle. 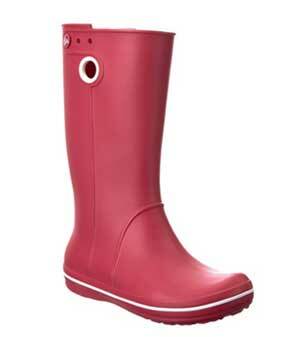 Short sized pillar box red rain boots. 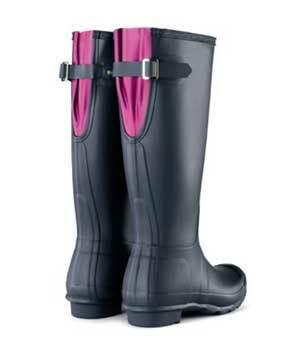 Edgy pair of women’s wellies, perfect for the outdoor music festival season. 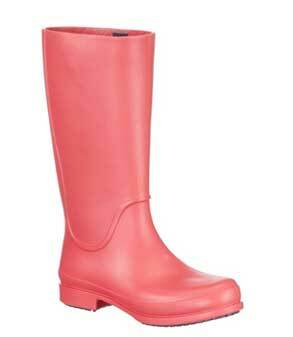 Crocs rain boots are all manufactured from their exclusive super light and flexible Croslite material. This one is their groovy pink version. 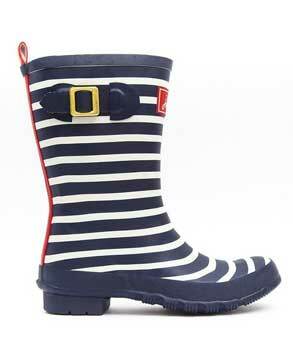 Playful light weight pull on wellies that are cute and comfortable. 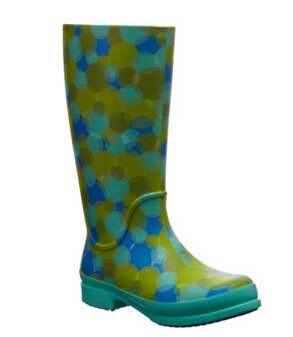 classic style green and blue spotted wellie boots. All the comfort and flexibility you would expect from Crocs but with a funky leopard skin pattern. 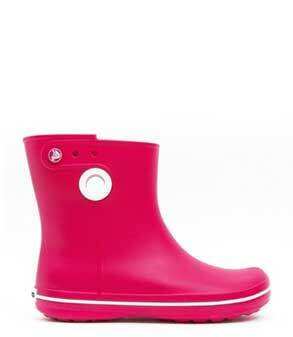 The hugely popular Rainfloe waterproof boot from Crocs. Functionality and style rolled in to one boot. 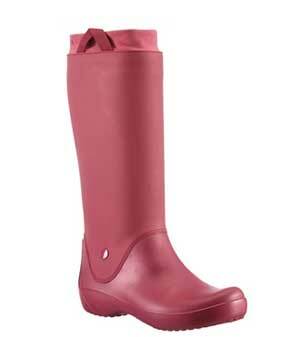 Elegant tall wellie with all the flexibility that you would expect from Crocs Croslite material. 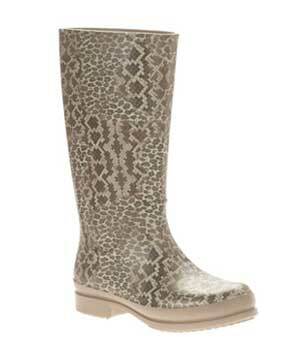 Ankle rain boot that is perfect for those rainy day walks. 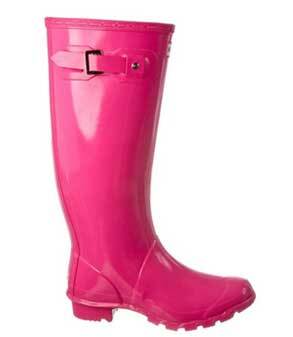 Spy Love Buy Rain Boots. 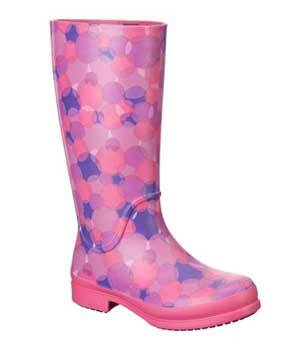 Pretty baby pink and blue polka dot wellies with decorative buckle. 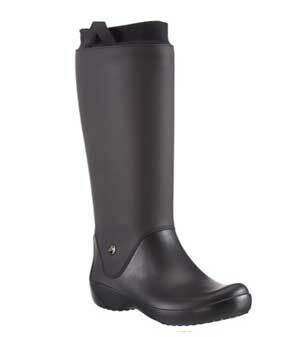 No collection of waterproof foot wear would be complete without the classic tall Hunter. 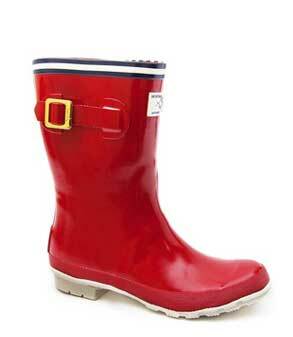 The preferred wellie boot of many celebs. If you fancy a cute pair of ankle rain boots that are super comfy, then these stylish designs from Rockport may be the answer. 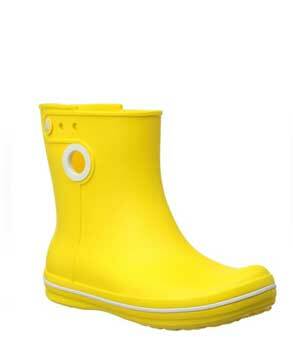 Bright yellow Crocs Jaunt boot. 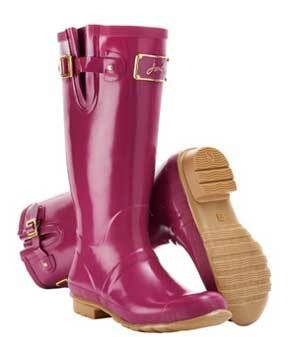 The short version of the very popular Jaunt wellie. Left – Tina O’Brien looking super cute in her classic black mid calf Hunter wellies. Layering a pair of funky socks with mid sized rain boots and pairing them with a short summer dress is a great look for the festival scene.